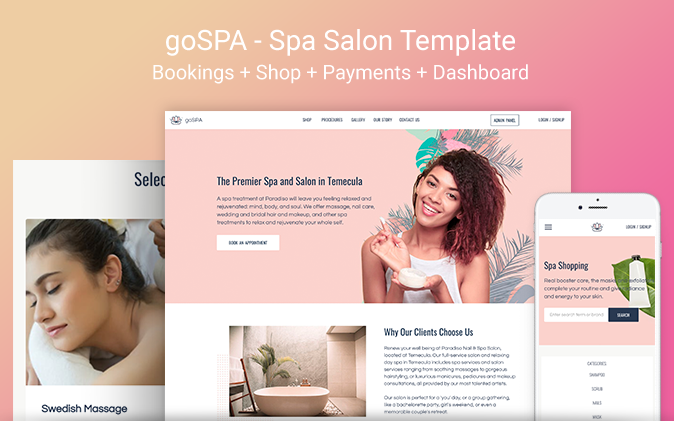 goSPA - Spa Salon Template is a modern template that you can use to create a clean, beautiful, and responsive website with booking and e-commerce components for your SPA, Beauty Salon, Therapy, Wellness Center or any other relevant businesses. Complete E-commerce solution with product management, checkout page etc. Super fast site development with backend editing. No coding, drag and drop website building. Smart service showcasing for higher conversion. Unique story page to share your company’s story. User profile page showcasing the products purchased by current user. Admin page provides the options to manage your products and services available. Regular updates and instant customer support.